The Comark T220AK Pocket Thermometer with 1 inch Dial, 0F to 220F is an easy and accurate way to check temperatures quickly. Constructed of durable stainless steel the Comark Pocket Thermometer has a 5 inch stem and a 1 inch watertight, plastic magnifying lens. The Comark Pocket Thermometer even offers easy calibration with a finger pressure operated calibration nut. 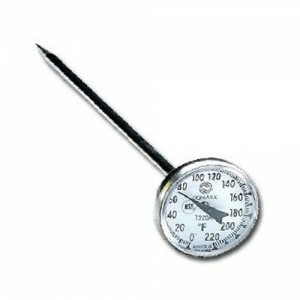 Built to last the Comark T220AK Pocket Thermometer with 1 inch Dial, 0F to 220F is ideal for use in any kitchen setting.